The earliest parts of the original collection of Pauline letters were written between CE 50 and 130 by Simon of Samaria and his successor, Menander. Simonians were secretive, so the collection was likely intended for their use only. But by the early 130s some proto-orthodox Christians came to know of it and, by making certain additions and modifications, attempted to co-opt it for proto-orthodoxy. One immediately noticeable difference between our hypotheses is that I hold, as argued in the previous post, that the original letters to the Ephesians and Colossians were written by the Simonian Menander, not Marcion or a Valentinian. To me, the passages that Price sees as Marcionite or Valentinian in these letters can just as plausibly be identified as Simonian. The theological development present in them is nothing that could not have already occurred within Simon’s communities in the generation after him, and thus before either Marcion or Valentinus are thought to have been active. Forty years—say, from CE 60 to 100—seems like plenty enough time for that development. And if so, the proto-orthodox interpolations could have been inserted with Simonians in view. The proto-orthodox reworking of the letter collection could have been a fait accompli by the time Marcion and Valentinus went to Rome in the late 130s. To illustrate my point, let’s consider some specific instances. In regard to verse 2:5: I have already explained in my previous post how I would account for the realized eschatology expressed by “vivified us along with Christ.” This is not a doctrine the proto-orthodox interpolator would have added. It is rather a teaching of Menander that the proto-orthodox redactor allowed to remain in the text because it was rendered harmless by other offsetting insertions. Nor do I see the words “and by his favor you have been saved” as an interpolation. As already noted in my first post, Irenaeus clearly says that salvation by grace was a teaching of Simon of Samaria. I do agree with Price that some tampering has occurred in the three verses in question. Specifically, I agree that the references to forgiveness of sin and trespasses have been added. These belong to proto-orthodox soteriology which put forward the death of the Son as an expiatory sacrifice or atonement for sin. But I’m not convinced these insertions were made to combat Marcionite belief. They could just as plausibly have been added to correct Simonian error. For ransom soteriology was not created by Marcion. In the extant proto-orthodox heresiological writings, the earliest figure to have a ransom soteriology attributed to him is Simon of Samaria. She [Helen] lived in a brothel in Tyre, a city of Phoenicia, where he [Simon] found her on his arrival… And after he had purchased her freedom, he took her about with him… For by purchasing the freedom of Helen, he thus offered salvation to men by knowledge peculiar to himself (Hippolytus, Refutation of All Heresies 6, 19). The sense, then, of “ransom” appears to be release from those who keep one from returning home. That being the case, I would retain “the one by whom we have received release” in Eph. 1:7a as authentic, but reject the remaining words of the verse (“through his blood, the forgiveness of trespasses”) as an interpolation. The purpose of the interpolation was to make to make the “release” look sacrificial and expiatory much along the lines of so many passages in the proto-orthodox Letter to the Hebrews. The use of the word “blood” in the interpolation had an additional proto-orthodox benefit—an anti-docetic one. A real sacrifice requires real blood, not the mere appearance of it. So connecting the “release” with blood also counters Simon’s teaching that the Son of God, at his first entry into the world, had merely appeared to be a man and merely appeared to suffer. But note again how there is no need to see Marcion as the docetic opponent targeted by 1:7a. He was not the first Christian docetist. The proto-orthodox heresy-hunters give that distinction to Simon of Samaria. God the Father: Marcionite/Valentinian or Simonian? Sufferings of Christ: Christ did not suffer, according to Simon; but in his successor, Menander, he did complete his sufferings. Satornilus, like Menander, teaches one Father unknown to all… (1, 24, 1). Now I am rejoicing in my sufferings on your behalf, and in my flesh I am completing what is lacking of the afflictions of Christ, on behalf of his body that is the church. From a Simonian perspective, it was not that someone else was completing the Son’s suffering; it was the Son himself, in Menander, who was completing what the Son himself had previously started. But even the slightest real suffering of Christ’s body, whatever its nature, would have had infinite value, as the suffering of the Son of God. And so it would seem almost blasphemous to claim that any suffering of his—no matter how small—was somehow inadequate and needed to be completed by someone else. Now notice that in Col. 1:24 it is not said the Christians in general complete the missing afflictions of Christ. And it is not said that apostles in general complete them. The one who completes them is the author of the letter. It is a task that belongs to him personally. And if, as I maintain, that author was Menander, it would make good sense of Col. 1:24. As a follower of Simon he believed that the Son, at his first coming, had only appeared to suffer. When the Son took up residence in Simon, he began to supply an element that was missing from his first visit: real suffering. Through Simon’s apostolic labors the Son began to make up for something he had deliberately left out the first time. And now the Savior was present again in Menander. To me, it seems plausible that Menander could view his imprisonment as some kind of completion of the Son’s missing sufferings. From a Simonian perspective, it was not that someone else was completing the Son’s suffering; it was the Son himself, in Menander, who was completing what the Son himself had previously started. It is not just Marcionite or Valentinian authorship of Ephesians and Colossians that I would contest. I am not convinced that Marcionites or Valentinians composed any part of the ten-letter Pauline collection. I see no clear indications in it of any distinctively Marcionite or Valentinian doctrine, not even in the letter to the Galatians. Dr. Price holds—rightly, in my opinion—that chapter 4 of Romans is the work of Simon/Paul. But he ascribes authorship of the core of Galatians (chs 3-6) to Marcion. . . [Though ch 3] consists of the same basic argument . . .
Dr. Price holds—rightly, in my opinion—that chapter 4 of Romans is the work of Simon/Paul. But then he goes on to ascribe authorship of the core of Galatians (chapters 3 through 6) to Marcion. Now, the third chapter of Galatians consists of the same basic argument as Romans 4: justification by faith. And it is hard to see how Marcion could have subscribed to that argument as it stands, for involving as it does an earlier Old Testament figure, it would seem to mean that Marcion’s Stranger-God was not a complete stranger to mankind after all. If Marcion wrote chapter 3 of Galatians, his unknown God appeared previously to at least one man, Abraham. Jerome and Tertullian both attested that Marcion changed verse 14 [of Galatians 3], “that in Christ Jesus the blessing of Abraham might come upon the gentiles, that we might receive the promise of the Spirit through faith,” to “that we might receive the promise of the Spirit through faith.” Obviously, this was to omit all reference to Abraham…” (p. 423). To me, the passages about the faith of Abraham in both Romans and Galatians make sense as a Simonian teaching, but not as a Marcionite one. To me, the passages about the faith of Abraham in both Romans and Galatians make sense as a Simonian teaching, but not as a Marcionite one. Simonians appealed to parts of the Old Testament as authoritative. They seemed to have cherry-picked the Old Testament and resorted to allegorical interpretation of it, especially the book of Genesis. Simon, in the exposition of his Apophasis Megale system, gives an allegorical summary of the five books of the Pentateuch. And he quotes verses from the books of Isaiah and Jeremiah. Marcion, on the other hand, appears to have made a clean break with the Old Testament, refusing to use it in any positive way to support his teaching. Any use of it by him was apparently limited to “ad hominem” argument. There is no indication in the extant record that he made exceptions for any parts of the Old Testament, not even the Genesis account of Abraham. Nowhere do we find recorded that, according to Marcion, the Father of Jesus had in fact spoken to at least one man prior to the descent of Jesus into this world. But to this I would respond: the seed form of Marcionite doctrine apparently goes back to the first century, to Simon of Samaria. And since it is present in seed form in Galatians, that letter makes more sense as Simon’s work. 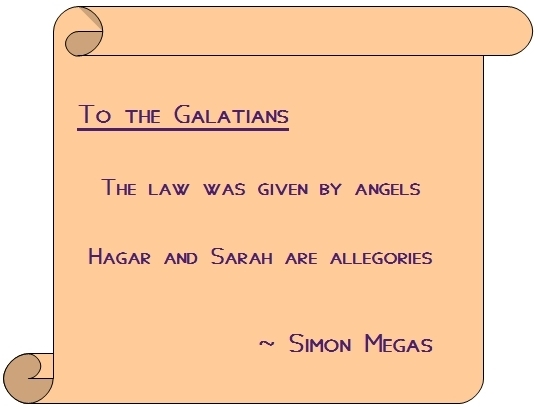 And I would add too that the allegory that follows in Galatians (Hagar and Sarah) makes better sense as Simon’s composition. It is the kind of strained allegory for which he was notorious, an allegory by means of which “Simon got what interpretation he pleased, not only out of the writings of Moses, but also those of the pagan poets” (Hippolytus, Refutation of All Heresies 6, 19). Marcion, on the other hand, is said to have eschewed allegorical interpretation of the Old Testament. the striking comment of Tertullian in Against Marcion that Marcion nactus epistolam Pauli ad Galatas: “Marcion has discovered Paul’s Epistle to the Galatians” (p. 411). Furthermore, to take “nactus” in the sense of “discovered” seems unlikely for another reason. If Marcion had really claimed to be the discoverer of Galatians, I expect Tertullian would have made more than a passing reference to it. In his five-volume work against Marcion, he is eager to contest Marcion’s claims at every step. Surely, writing half a century after Marcion was active, it would have been easy for Tertullian to deny Marcion’s supposed claim unless it was firmly and universally recognized as true. But nowhere else in the extant record is there any whisper about Marcion being the discoverer of Galatians. One other aspect of this discovery scenario makes me uncomfortable too. If Marcion wrote the core of Galatians but claimed only to have discovered it, would this not—as Price suggests—put him in the same league with Hilkiah who “discovered” Deuteronomy and Joseph Smith who “discovered” the book of Mormon? I am reluctant to put him in that company. To me, he comes across as a refreshingly open and honest character. At a time when so many Christians were engaging in outright forgery, attempting to pass off their writings as belonging to an earlier time, his Antitheses stands out as an honest, straightforward critique put forward in his own name. He did not attempt to pass that work off as a long lost book of Paul. Or even as divinely revealed to him by Jesus or Paul. If Marcion wrote parts of the Paulines, why didn’t he bring the Gospel tradition into them as support for his contentions? Finally, by making Marcion “responsible for significant portions of the epistolary text” (p. 225) including the core of Galatians, Dr. Price gets into other significant difficulties. For “the epistles are quite innocent of the Gospel tradition of sayings and deeds by an earthly Jesus” (p. 225). So if Marcion wrote parts of the Paulines, why didn’t he bring the Gospel tradition into them as support for his contentions? I am reluctant to adopt this as a solution to the absence of the Gospel tradition from Paul’s letters. A better solution is available. If, as I maintain, the original collection of Pauline letters consisted of Simonian material, they could have been written before the composition of a gospel that featured a wandering, preaching, miracle-working, disciple-gathering Jesus. If the original letters were written by Simon and Menander, the collection of them could have been completed by around CE 100. And, consequently, there would be no need to post-date the earliest canonical gospels until after Marcion’s arrival on the ecclesiastical stage. And Mark’s “gnostic view of secret teachings” is better explained by a Simonian provenance than a Marcionite one. It was likely this openness, at least in part, that so worried the proto-orthodox. No longer were the blasphemies of Simon going to be passed on only among members of a bunch of secretive sects. With Marcion they went public. Now both Dr. Price and myself see Marcion as a real threat to the mid-second century Roman church. But my position differs from his in that I think Marcion only became a force to be reckoned with after his break with that church. I am inclined to think that Marcion became a convert to Christianity at Rome. Tertullian says that it was in the first warmth of faith (“primo calore fidei” – Against Marcion 4, 4) that Marcion made his large donation to the Roman church. Adult converts would have been nothing unusual at that time. The heresy-hunters Justin and Tertullian themselves both converted to Christianity as adults. Conversion would also explain why Marcion became Cerdo’s pupil and not vice versa. And Marcion’s status as a new convert would explain his simplification of Simonian doctrine. The Simonian cherry-picking of Old Testament verses and elaborate allegorical interpretation of them were not embraced by Marcion. This avoidance of complication strikes me as something that a new convert would be drawn to. Converts often like to have clearly delineated what they are expected to believe and practice. It is easy to see how someone who had not grown up with the Old Testament and allegorical interpretation of it might be daunted and want to make the whole thing less arbitrary and more manageable. And Marcion apparently reduced the multiple world-making angels down to a single one: the Creator God. And the higher God who, according to Simon, was unknown to the world-making angels becomes—in Marcion’s system—unknown to absolutely everyone before Jesus revealed him. Thus no sparks of divine fire in man’s spirit for Marcion. He makes man entirely the work of the World-Creator. Man’s spirit no longer returns home; instead it goes to the home of a God who previously was a complete Stranger. To me, these changes make better sense as the work of someone who came late to Simonianism and never fully grasped or appreciated its complexity. Now this is not to say that Marcion was a lightweight. He wasn’t. He was wealthy. That’s always a big help. And he apparently had organizational ability—another big plus. And he apparently practiced what he preached. Many people are drawn to sincere ascetic types like Marcion. And no doubt his cutting loose of Christianity from the Jewish Scriptures also appealed to many, especially after the recent defeat of the Jews in the CE 132-35 war. For all these reasons I think the proto-orthodox felt genuinely threatened by Marcion’s new version of Christianity. One of the ways they responded to that threat was by using a tactic they had already used when they reworked the Simonian collection of letters around CE 130: interpolation. It was a tactic they were to use repeatedly during the next few centuries. Interpolation was a particularly convenient form of forgery, for it quickly and easily provided authority for one’s own views and disproved those of competitors. Bart Ehrman, in his book Forged, observes that “Nothing generated more literary forgeries in the names of the apostles than the internal conflicts among competing Christian groups” (p. 183). Since Marcion was such a formidable opponent, I would be surprised if the proto-orthodox had refrained from using forgery and interpolation in their struggle against him. Such short and simple insertions as Gal. 4:4 and Rom. 1:3-4 are all that is needed to effectively undercut Marcion’s Christianity. . . They could have been added any time after Marcion’s break with the Roman church. Such short and simple insertions as Gal. 4:4 and Rom. 1:3-4 are all that is needed to effectively undercut Marcion’s Christianity (though I suspect there are others). They could have been added any time after Marcion’s break with the Roman church. Dr. Price has indeed lent some order to the Pauline scraps. I heartily recommend his book. It is filled, as are all his books, with amazing insights. I have learned much from him. So I hope readers will not get the wrong impression from this post. What I would like them to take away from it is that we very much see eye to eye on the larger issues. Where we disagree is on the relatively minor issue of the role of Marcionites and Valentinians in the production of the Pauline letters. In my next post I will, again with help from Dr. Price’s book, inspect a few more Pauline passages. Posted on 2013-10-14 05:22:36 GMT+0000 by Roger Parvus. This entry was posted in Biblical Studies, Paul and His Letters, Roger Parvus, Simonian Origins and tagged Born of a Woman, Price: Amazing Colossal Apostle, Robert M. Price. Bookmark the permalink. This is well argued. A big problem for me was that Price’s Marcion has to believe in a mythical Jesus, and docetism arise later in the Marcionite tradition, but from what we are told, it seems Marcion himself was a docetist. Your theory makes better sense as it gives us mythical-Jesus Simonian originals and does not commit us to revising what we think Marcion’s faith was about. Thus no sparks of divine fire in man’s spirit for Marcion. Dr. Price is really impressive when he argues that every preacher was in every respect a Christ by his own law. From this I am inclined to think that not only Simon of Samaria, but also his followers tended to self-identify, following his example, with the Son, in some way. I would like (also) to know: what is the position of the Consensus on this? I mean, is this point recognized by most as yet indecipherable and enigmatic? Their ”solutions” are only, more or less, apologetical harmonizations ? Watts, for example, is able to identify a very cogent explanation for Mark’s portrayal of the disciples as blind till the end from a source that he can explicitly and directly identify as one used by the evangelist. That is surely a stronger argument than a hypothetical opposition to a branch of Christianity identified with the Twelve. Even though I like MacDonald’s idea that Mark in general and the ‘blind’ disciples dynamic in particular are modeled on Homer, I’m starting to suspect that Mark also knew (of) the Damascus Document, so I wonder if his presentation of the disciples as blind could have something to do with this passage. There is no consensus explanation for GMark’s negative portrayal of the Twelve. And that is because there is no consensus regarding the genre of GMark. Is it history? Theology? Catechesis? Allegory? As I stated in part 1, I think GMark is a reworked version of a Simonian allegory about Simon of Samaria. The public ministry of its Jesus is an allegory about Simon’s public ministry. So I would agree with Price that the Twelve are portrayed as buffoons for a polemical reason. But whereas he sees the polemics as Marcionite, I think they are Simonian. That is, the Twelve are portrayed negatively because they claimed to be disciples of the crucified Son of God, yet failed to recognize him or embrace his teaching when he came back among them in the person of Simon. I will get into this later in the series. Aha! In the Gospels folks have a tough time recognizing the risen Jesus. How do the autobiographical bits of Galations fit into this view? They’re usually taken as our best insight into Paul, so if he’s not the author, how does the persecution of The Church, the sojourn in Arabia and the Jerusalem Council fit with Simon (or even Menander) as the author? This is certainly an interesting exegesis of the Pauline corpus, and given that we only really (with the possible exception of 1 Clement) have letters attested as a corpus, it’s not unreasonable to suggest they could have been tampered with early on. I’ll look forward to your analysis of the gospel, for as I’ve mentioned, I’m disinclined to accept a very late date for them – despite being myself fairly late (Mark 70-75, Luke c 100, Matthew pre-Luke and John post-Luke). I’ve been working on my next post and it’s a little more than half completed. It was going to be about some passages from 1 Corinthians and Philippians. But your question has led me to change my plans. In part four I started discussing Galatians, so at this point I guess I really should address its “autobiographical bits” too. It will provide a good example of how the proto-orthodox interpolator of the letter went about changing its real author, Simon/Paul, into his new, proto-orthodox Paul. So the next post will consider chapters 1 and 2 of Galatians from the perspective of my hypothesis. Thanks. Looking forward to it! Sorry to break your stride. Looking forward to this, Roger! You speak of the secretive nature of the Simonian churches in contrast with the openness of Marcion, which the proto-orthodox community considered a greater danger. This makes me wonder what the public face of a typical Simonian church was like. What did it make public and what did it keep secret? Did it appear the same as the proto-orthodox churches to the public, but had a set of secret teachings it only shared with certain initiates? It almost sounds to me like you are saying that Simon and his followers never came out directly against the OT or suggested that Jesus’ Father was not the God of Israel, but that Marcion had no interest in keeping his beliefs secret and decided to bring his real beliefs out in the open. Thanks again for your great insights. I wonder too what the public face of a typical Simonian church was like. I expect that it made public the writing that was its gospel, which—as I discuss in posts 7 through 9—was likely the Vision of Isaiah. That would mean it publicly preached that the events prophesied for the last times by the Vision had been fulfilled. The Son had recently descended incognito, been crucified, and had risen back to his Father in heaven. Heavenly robes, crowns and thrones are stored up in heaven for those who believe the Vision. But I’m less confident that the Simonian church immediately and fully divulged its particular interpretation of the Vision to prospective converts. That is, it may have held back its beliefs that the highest God in the Vision was not the God of Israel and that the OT was largely inspired by the lower world-making angels. The proper time for making those known may have depended in part on whether the prospective convert was a Gentile, a Gentile God-fearer, a Jewish proselyte, or a Jew. There are at least two items of Simonian belief that I doubt were preached or immediately made known to prospective converts: Simon’s claim to be a new manifestation of the Son and his claim that Helen his companion was the recently freed Holy Spirit. These two items, I expect, were part of the “solid food” that could only be given to chosen pneumatics, and certainly not to the “sarkic” or “infants in Christ” (1 Cor. 3:1-2). In regard to Marcion: I don’t think he ever was, strictly speaking, a Simonian. I suspect that the only collection of Simonian letters he knew were ones that had already been re-worked by a proto-orthodox Christian. They had Paul’s name on them as their author. And by the time Marcion came on the scene, there were already written gospels that featured a Son with a public ministry. Marcion came to believe that some serious tampering had occurred both in regard to the Pauline letters and to the Jesus figure of the gospels, but I don’t know that he ever clearly grasped how Christianity arose and what had happened to it since its birth in the first century. But, in any case, none of the proto-orthodox anti-heretical writings accuse Marcion of holding secret doctrines. He openly proclaimed that the Father of Jesus was neither the God of Israel nor the source of inspiration for the OT. Thanks for your reply. I’m surprised to hear you say that you don’t think Marcion “ever was, strictly speaking, a Simonian.” Even if his copies of the Pauline letters had already been re-worked, his doctrine still reflected the early teachings of Simon, didn’t they? I also wanted to ask you about the use of the name Paul on the letters. I know you think this is part of the later editing of Simon’s original letters. But isn’t it possible that Simon actually began using the name Paul, just as Acts portrays a similar change from Saul to Paul? Like you, I am a fan of Robert M. Price and have been reading his Amazing Colossal Apostle. Price makes the connection between Simon Magus and the magician Elymas in Acts 13. Saul wins the battle and Elymas is struck blind (just as Saul had been). The governor Sergius Paulus is converted, and from that moment Saul is called Paul (Acts 13:9). In that context, it seems that he takes the name Paul from Sergius Paulus, either to commemorate the victory or to honor his new patron. If Elymas was really Simon, then it is possible he really did convert this governor of Cyprus and took his name. So the use of the name Paul on these letters would be original. Do you think any of this is possible? Still anxious to hear from you on this question of the name Paul. Let me know if my reasoning was unclear. I can take another shot at explaining my thinking. I apologize. I somehow missed seeing your comment when it was posted. 1. As I noted in the post above, there are some significant differences between the teaching of Simon and Marcion. See the section “Marcion Simplified Simonianism?” And I think Marcion, like most second century non-Simonians, believed that Jesus was historical and not just an allegorical representation of Simon’s gospel versus that of the Jerusalem church. As I see it, Acts account of the conversion of Sergius Paulus is another of its elements that should be filed under “fiction”. I agree that the contrast between Paul (small) and Simon “the great” seems too much of a coincidence. If this was the intent behind the name, it seems natural for me to think that the name originated with Simon’s enemies to insult him. But I am trying to follow your concept of Simon’s followers thinking of him as “indivisible” and choosing to use the name Paul (small). Do you think this name was used to remind his disciples that, though he started out small, too small to be divided (indivisible), he has since become great because of God’s blessing? That the use of the name Paul (small) was not an insult, but a reminder of the transforming power of the gospel? Stuart Waugh has his own versions of Marcion’s Pauline letters with footnotes he thinks are post Marcion Catholic redactions. “and other of the apostles I did not see, except James, the brother of the Lord.” Galatians 1:19. Is this reference to James as Brother of the Lord considered original (Simonian) material or a later interpolation? The only reference I know that suggests the “James the brother of the Lord” passage might be an interpolation is by A.D. Howell Smith. See James Brother of the Lord: Another Case for Interpolation. Thanks. I enjoyed that read. I had Colossal Apostle, I wanted to see what Price said. But from the link you provided, it seems to be attributed to early gnostic writings. Price seems to be making the case that this is port-Marcion Catholic interpolation. Can you explain your statement that Rom. 1:3-4 and Gal. 4:4 could have been added after Marcion’s break with Rome? From everything you’ve said until now, it would seem natural to assume that these texts were added with all the other interpolations long before the time of Marcion to debunk Simon’s docetism. I was hedging my bets. I am quite comfortable with the idea that the source of Simon/Paul’s gospel was the Vision of Isaiah (see posts 7, 8 and 9), but I am less comfortable about whether that writing contained a birth scene. As pointed out in post 8, one version has a birth (albeit docetic) for the Son, while another does not. Which version did Simon/Paul know? I’m undecided, and so I’m undecided about how Rom. 1:3-4 and Gal 4:4 should be understood. In their contexts they come across as irrelevant. 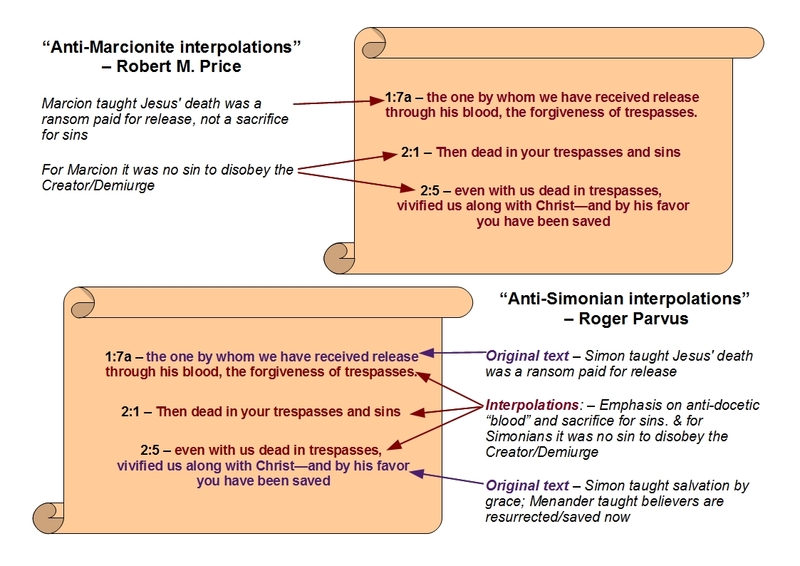 But if they are interpolations, it would not necessarily be Simon/Paul they have in view. The earliest anti-heretical writings clearly record Marcion’s denial of a nativity for the Son, but as far as I know they never trace that denial back further to Simon. So just to be clear: although in post 8 I offer a speculative alternative for the Son’s entry into this world, I am still very much open to the possibility that the entry Simon/Paul knew was the one laid out in the Vision of Isaiah’s longer chapter 11. That is to say, in my opinion there is still a decent chance that Simon/Paul’s gospel included the Vision’s docetic birth scene. Roger, I am interested in your point that Marcion simplified Simonian doctrine, reducing the role of the multiple world-making angels down to the single Creator God. But I see Paul frequently reducing the role of these ruling angels to a single person: Satan the Devil. Is it possible that he thought of Jehovah as the Devil? That he understood the two powers of the Father and Jehovah (Satan) just as the Persian Zoroastrians believed in the two powers of Ahura Mazda and Ahriman. There is no doubt that Israel’s belief in the Devil came from their exile under Persian rule. I am not doubting that Paul/Simon believed in multiple ruling angels, but your theory doesn’t seem to account for the fact that Paul believed in the unique role of Satan who rules the angels and is considered the God of this age. Simon/Paul may very well have believed in, as you say, a “unique role of Satan who rules the angels and is considered the God of this age.” My point was that Marcion’s belief regarding the making of the world appears to be a simplification of what we see in the accounts of Simon, Menander, and Saturninus. They speak of world-making angels (plural). Saturninus even gives us a number: “seven, one of whom was the god of the Jews.” But Marcion, as far as we know, spoke of a single world-maker (Demiurge): the God of the Jews.